SSAT - SHOULD DIFFUSE MAIN-DUCT INTRADUCTAL PAPILLARY MUCINOUS NEOPLASMS BE TREATED WITH TOTAL PANCREATECTOMY? Background: Main-duct (MD) intraductal papillary mucinous neoplasm (IPMN) is associated with a high risk of malignancy. There is a lack of international consensus (partial or total pancreatectomy) when the MD of the whole gland is involved. The fate of the remnant after partial pancreatectomy for benign diffuse MD-IPMN is unclear. Methods: Consecutive patients with partial pancreatectomy for benign MD-IPMN from 2004 to 2016 were analyzed. Exclusion criteria include any malignancy on final pathology and less than one year of post-operative follow-up. Diffuse MD-IPMN was defined by preoperative imaging as dilation of the MD in the head of the pancreas more than 5mm and involving the whole gland. Results: Of 127 patients with resected benign MD-IPMN, 47 (37%) had diffuse MD involvement. The majority (96%) underwent pancreaticoduodenectomy and 2 (4%) had distal pancreatectomy secondary to a cyst or larger MD dilatation in the tail. Median age was 73 (IQR: 67-79) with median duct size of 8 mm (IQR 6-13mm). High grade dysplasia (HGD) was observed in 24 (51%), intermediate grade in 21 (45%) and low grade in 2 patients (4%). Two patients had HGD at the resection margin. A median progression free survival (PFS) of 84 months was observed, with 10 (22%) patients developing imaging evidence of progression or new cystic disease in the pancreatic remnant at a median of 25 months. Three of 10 (30%) underwent completion pancreatectomy with no cancer identified in the remnant. A margin positive with intermediate or high grade dysplasia was significantly associated with shorter PFS (HR:4.39, 95%CI 1.05-18.46, p=0.043). When compared to those with focal MD involvement, patients with diffuse MD-IPMN were older (73 vs 67, p=0.009), more likely to receive a pancreaticoduodenectomy (96% vs 56%, p<0.001) and more likely to have high grade dysplasia (51% vs 31%, p=0.025). Nevertheless, MD involvmenet (diffuse vs focal) was not associated with PFS following surgery (p=0.328). Conclusions: Partial pancreatectomy is an appropriate surgical approach for diffuse MD-IPMN and is not associated with earlier progression after surgery. Progression in the pancreatic remnant requires ongoing close follow-up. 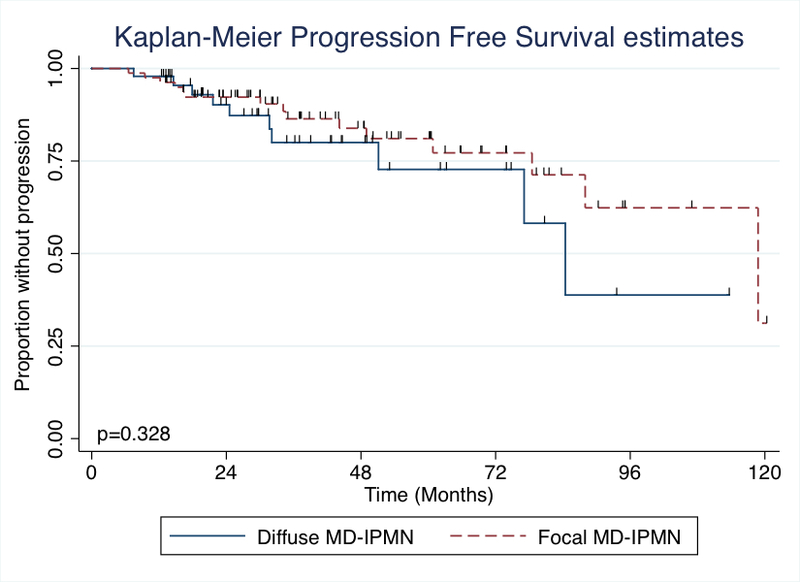 Figure 1.The degree of main duct involvement, diffuse vs focal, was not associated with a shorter progression free interval in patients with partial pancreatectomy for benign IPMN.